If you are a full-timer or a weekend warrior that enjoys taking the family with you to see the countryside, this fifth wheel might be perfect for you. 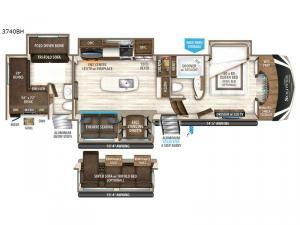 The owners can relax in the front master suite while the kids call the rear bunkhouse with a half bath and second exterior entry door their own private oasis away from mom and dad. Everyone will enjoy coming together for meals in the spacious kitchen and living area thanks to the dual slide outs. The cook can make meals with the professional grade stainless steel cooktop and convection microwave, plus store dry goods and snacks in the the oversized pantry and stainless steel 12 cu. ft. four door refrigerator. The cook might even like to grill burgers outside on the outdoor kitchen. Be sure to keep warm by the fireplace while watching your favorite team on the big screen TV. You might even like to choose a few options such as adding a washer and dryer, a king size bed, a residential refrigerator, and/or a super sofa. Come see what else you can't camp without in this Solitude S-Class. With each Solitude S-Class fifth wheel by Grand Design you will receive affordable luxury for your extended stays or weekend get-a-ways. From the solid foundation including Equa-Flex suspension to the taller ceilings, taller and deeper cabinets, the power reclining theatre seating with swivel tables including LED lighting, plus a heat and massage function, a Stealth AC system, and the Weather-Tek package which allows you to travel any season you choose. It's time to enjoy luxury living where ever you decide to land.